Landing page represents the first page that a visitor sees on your site. The landing page does not have to be your home page. It can be any page. A good landing page should help a visitor to find what he/she is looking for within the shortest possible time. Optimization of landing pages is rather laborious process. There are quite a number of methods how you can improve your conversion rate: testing a shorter page, research on a serious level, selling text, colorful design, high-quality layout and so on and so forth. 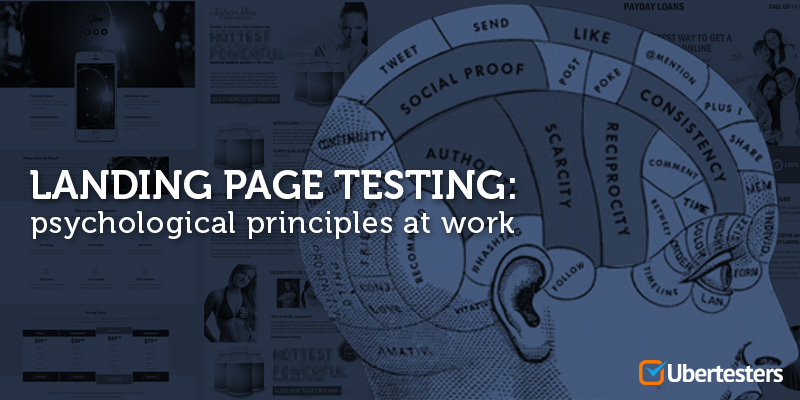 Let’s look at three basic psychological principles that ensure the effectiveness of your landing page and will help you to achieve the goal – to increase conversion. 1. Psychology of pleasure: focus on those things that should make your prospects happy. People are happy when they see positive, smiling people so don’t forget to use testimonials and photos of pleased, satisfied customers. People are happy when you understand them. Try to know fears, expectations, and needs of your visitors. It will help you to create a landing page that will be focused on their needs and demands and therefore will speed up the process of converting your potential customers to your real ones. People are happy when they are not forced to do unnecessary things. For example, to fill unnecessary fields or to confirm the billing address of a credit card in cases where the processing does not require their services. Test version of the landing page of your website with a minimum number of fields and you will see the change in the conversion. People are happy when they find what they are looking for. Provide your visitors with the exact information they are expecting to find. Besides, make sure that your promotion will lead potential customers to your landing page, but not to the home page of your web-site. People are happy reading happy words. Make sure that your selling text is positive, delightful and optimistic. Like what you’re reading? Sign up now to receive our hottest tips & tricks for free! The presence of distracting suggestions. The landing page should be specific. It is important that other proposals and some completely unnecessary additional information mustn’t confuse the visitors. The complexity of the order. You shouldn’t complicate everything for your potential customers. They should be able to make an order directly from the landing page. It is not necessary to ask them to proceed to the main page, perform there some actions, then … well, you’ve got the idea. The landing page should give the opportunity to order the product. The complete absence of real reviews about your product. The reviews are very helpful since they seriously increase the credibility of your product or service. People understand that someone else has already used it and were satisfied. A second important point is that the appeal should be the only one on the page and specific enough in this case. You shouldn’t distract your potential customers by other offers that will disorient them. The title is misleading. It may happen that the offer on the landing page corresponds to advertisement, but his header doesn’t. Someone might say that this is a small error and the user will understand. Nevertheless, the first thing a visitor will notice is the title of the proposal. And it should not be misleading. The title should clearly reflect what was presented in the advertisement. And be specific. It’s a little sin that leads internet marketers to hell. 3. Psychology of spending: how much do your users ready to spend? Depending on how much money they are ready to spend customers are divided into two large groups: savers and spenders. These are two small tips concerning both of these groups that can improve your conversion rate. Try to find the price that will be perfect for your potential customers and show them these figures. In other words, give them the number that they want to see. Show your potential customers how much money they will be able to save by purchasing your product.